Perhaps, in retrospect, JV Games should have seen this coming. After all, drinking games and video games may be two of college kids' favorite pastimes, but they are also a source of constant complaints from the students' middle-aged parents. So when the softwaremaker tried to combine the two adolescent activities, many critics felt it had gone too far. Beer Pong is a virtual rendition of the popular college drinking game that requires players to toss Ping-Pong balls across a table and into a cup of beer (if your cup is hit, you drink). The game was designed for the popular Nintendo Wii platform, and its maker had planned to release it as the first game in its new Frat Party Games series. But concerned parents began sending angry letters to JV Games and Nintendo  Connecticut attorney general Richard Blumenthal even got in on the action, sending his own missives to the companies  until JV Games agreed to change the title of the game to Pong Toss and fill its pixelated cups with water. "We never anticipated such a severe reaction to the word beer," says Jag Jaegar, co-owner of JV Games, which released Pong Toss on July 28 with a kid-friendly rating of E for Everyone. The controversy isn't entirely surprising. The point of beer pong is to get your friends drunk  and parents and university administrators generally frown on that sort of thing. Last fall, Georgetown University banned beer pong, specially made beer-pong tables and inordinate numbers of Ping-Pong balls and any other alcohol-related paraphernalia in its on-campus dorms  even in the rooms of students of legal drinking age. The University of Pennsylvania, Yale University, the University of Massachusetts at Amherst and Tufts University have also banned drinking games. "We're pleased that Tufts has put this in writing," says Michelle Bowdler, a health administrator at the school. "Although we understand that 21 is the legal drinking age, we don't want our students participating in activities that could do excessive harm to themselves or others." Bowdler has a point. Recent data from the Harvard School of Public Health's College Alcohol study, which surveyed more than 50,000 students at 120 colleges, show that binge-drinking habits vary widely from campus to campus. Kids tend to party hardest at schools with few official alcohol-control policies, easy access to alcohol and strong drinking cultures. Still, there's no guarantee that simply taking the beer out of beer pong will have the sobering effect that college deans intend. Last year, Dartmouth College banned water pong, the real-world version of Pong Toss, because of the risk of water intoxication  it's no joke, as an H2O overdose can be fatal. "I know that [water pong] seems like a good balance between the Dartmouth drinking culture and just trying to have fun," Kristin Deal, a Dartmouth community director, wrote in an e-mail to students announcing the prohibition. "However, it can be just as dangerous, if not more so." The anti-pong activism strikes JV Games' Jaegar as somewhat fruitless. As long as students "have access to alcohol, they will create drinking games out of any activity," he says. More to the point, if students have access to alcohol, they'll drink it  no games necessary. "You can't drink if you're not 21, but that does not seem to have deterred [students] in any way," admits Tammy Gocial, dean of students at Kenyon College in Ohio, where a drinking-game ban has been officially repealed. Gocial notes that it's already against the law for underage students to drink, so "to do the same thing [with a campus ban]  we know it's not working," she says. Instead, according to Gocial, Kenyon is developing a student-responsibility campaign in an effort to change campus culture and reduce binge-drinking. Could this mark the beginning of the end of beer pong? The game does have plenty more critics outside the walls of academia. The town of Belmar, N.J., for example, outlawed outdoor beer pong in 2005 after the city council passed an ordinance declaring that it exposed unconsenting neighbors to "foul language, rowdy and disorderly behavior and to examples of the consumption of alcohol under circumstances that are detrimental." Two other Jersey shore towns Manasquan and Sea Girt have followed suit, and state officials in Pennsylvania and Virginia have made bars put away their pong tables. 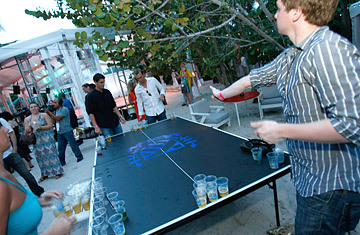 But pong also has its fair share of enthusiasts  many of them will congregate in Las Vegas in January for the fourth annual World Series of Beer Pong, hosted by the site bpong.com. So despite an increasing number of colleges and towns prohibiting the game, it likely won't fade without a fight. The original version of this article incorrectly stated that the video game Pong Toss has a kid-friendly rating of T for Teen, when in fact it has a rating of E for Everyone.